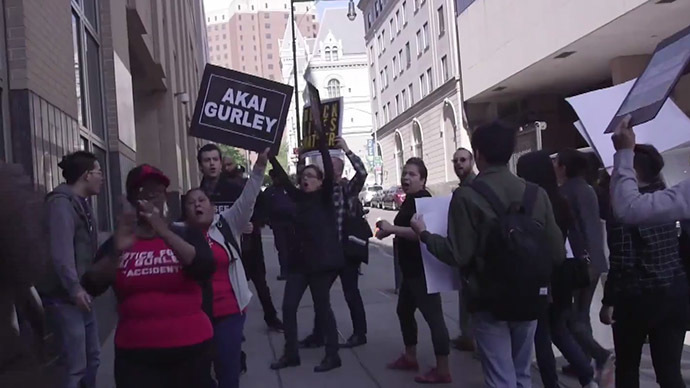 Protesters joined the family of Akai Gurley outside the Brooklyn courthouse, where lawyers for New York police officer Peter Liang asked for charges against him to be dropped. Liang claims his fatal shooting of Gurley in November 2014 was accidental. A group of about 100 demonstrators marched outside the Kings County courthouse on Thursday morning, chanting about justice, racist police and human rights. Though lawyers for both Liang and the Gurley family did not wish to comment on the case, Gurley's domestic partner Kimberly Ballinger said the death was rough on their two-year-old daughter. A Brooklyn grand jury indicted Liang in February, charging him with second-degree manslaughter, reckless endangerment, second-degree assault and official misconduct. If convicted, he could go to prison for up to 15 years. Liang has pleaded not guilty and his lawyers have filed a motion that all charges be dismissed, local media report. The next court date in the case is June 23. On November 20 last year, Liang and his partner Shaun Landau were conducting a “vertical patrol” in the stairwell of the Louis H. Pink Houses, a Brooklyn public housing project. At the time, Liang had been on the force for less than 18 months. The stairwell was dark because the maintenance crews had not replaced the broken lights. Both officers were holding flashlights and had their guns out. According to his testimony, Liang was opening the door of the eighth floor landing with the same hand in which he was holding his Glock. He claims the gun went off by accident. Akai Gurley, 28, and his companion Melissa Butler, 27, were entering the stairwell from the seventh floor at that time. According to Brooklyn District Attorney Kenneth Thompson, the bullet from Liang's gun ricocheted off the wall and struck Gurley in the chest. Thompson said he did not believe that Liang wanted to kill Gurley. “But he had his finger on the trigger, and he fired the gun,” Thompson told reporters in February, following the officer's indictment. On that occasion, Liang's lawyer, Stephen Worth, said Gurley's death was a terrible accident but that the officer hadn't done anything wrong. Though the New York Times quoted Thompson's insistence that charges against Liang had “nothing to do with Ferguson or Eric Garner or any other case,” protesters have linked Gurley's death to what they say is a nationwide pattern of police mistreatment of African-American men.